One of the things I love about Chris (there are lots. I’m sure I’ve shared with you some and I’m sure I’m going to share more), is that he has just as much of a sweet tooth as I do. He loves a good piece of high quality dark chocolate and he will never turn down a vegan cupcake if there’s one nearby. He’s probably just as much of a cookie monster as I am. 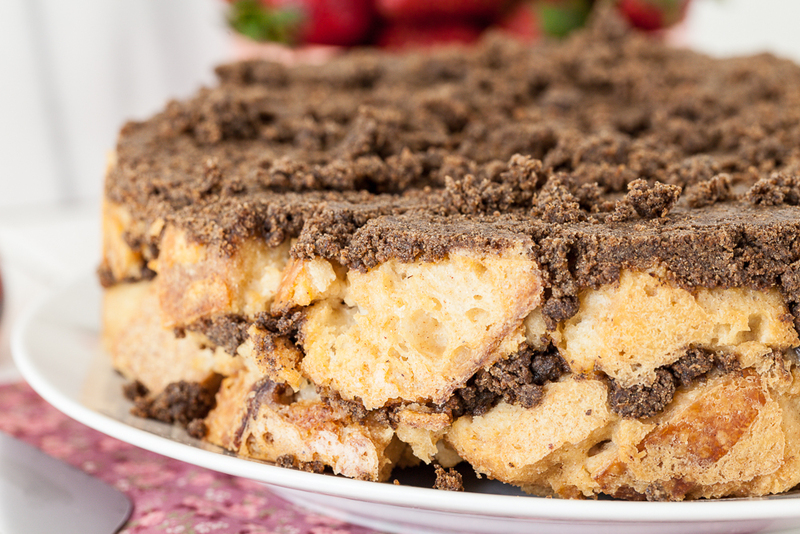 One of his favorite desserts, however, is coffee cake. 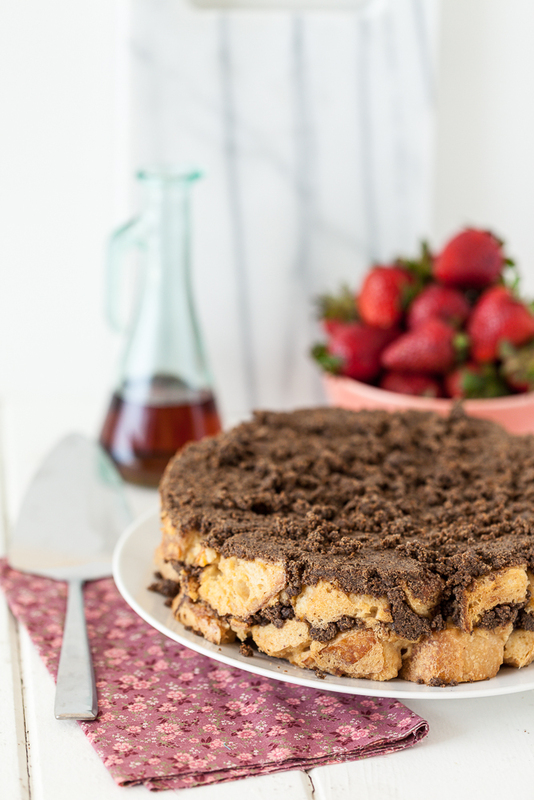 For Easter brunch, I wanted to make him something kind of special but I also wanted to make something I knew the twins would go for (I was unsure of how they would react to straight-up coffee cake). 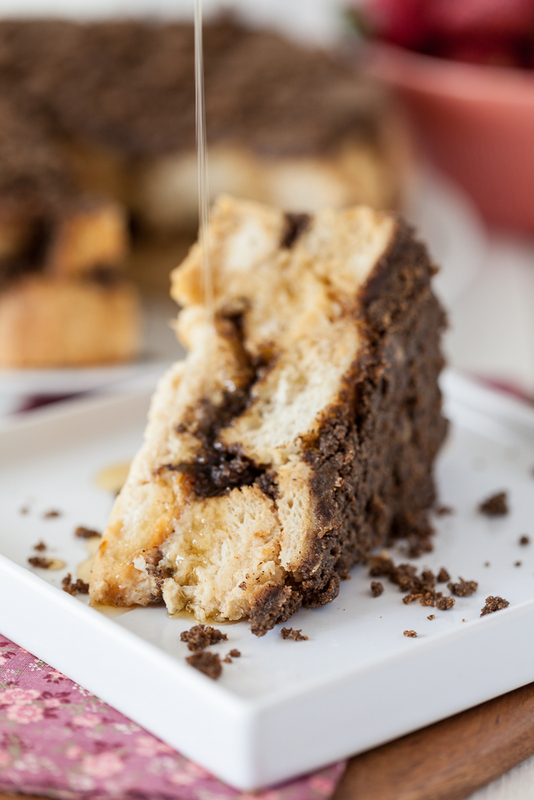 I also wanted something a little heartier than coffee cake and since I knew the twins like baked french toast, I decided to create some sort of coffee cake/french toast hybrid. It was kind of a risky stunt- trying out a new recipe for Easter brunch. I figured, though, how bad could some baked french toast with streusel topping turn out? I used a two day-old loaf of crusty sourdough bread, cut into thick slices and then into large cubes. I used chickpea flour in the french toast mixture, which adds that slightly eggy french toast taste as well as some protein. I also sweetened the french toast with maple syrup. I made the french toast mixture the night before so it could soak overnight. I also made the streusel the night before so all I would have to do in the morning was assemble it and bake it. I decided to used a springform pan purely for aesthetic reasons. I wanted to be able to see the crumbly layer of streusel between the layers of french toast and I wanted to be able to slice it like a cake. Hearing Chris and Sophia “Ooooooh” and “Aaaaahhh” as I pulled the outer ring off the cake and then again when I turned it out onto it’s serving plate made it all worth it. In my mind cinnamon and french toast go hand-in-hand but this took it a step further. 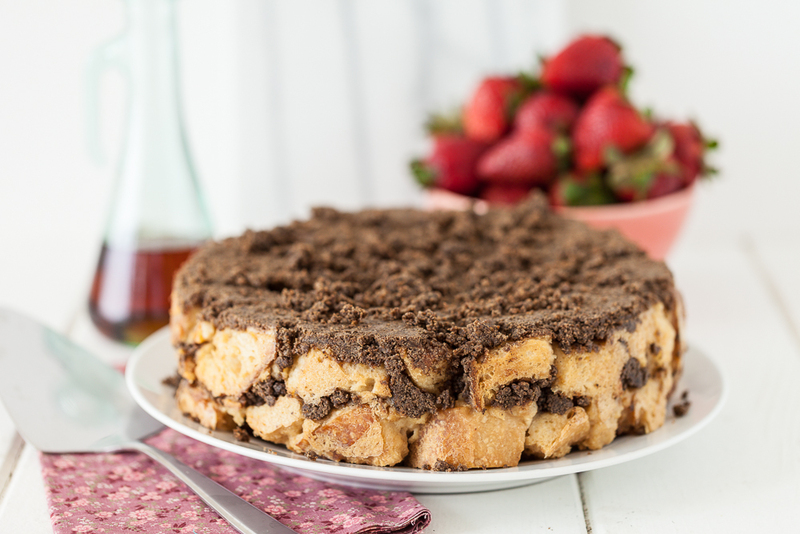 As it turns out, crumbled streusel topping was just what my french toast has been missing all these years! I also loved how my brain was tricked into feeling like we were eating cake for breakfast, even though it was a hearty french toast. Chris and I even had to split a second slice because it was just so dang good. It was truly a decadent breakfast treat and totally worth the gamble. What made this the absolute perfect meal for brunch was not so much how pleased I was with how the recipe turned out but really how excited Chris was about it. He was muttering “wow” throughout our little photoshoot, and the “wows” kept on coming once he sat down to eat it. It’s one thing to please my sweet tooth, but to please Chris’s is so much more satisfying. Grease a 9-10 inch springform pan, or lightly spray with canola oil. Set aside. In the bowl of a food processor, combine the streusel ingredients. Pulse about 10-12 times, until you have small streusel-type chunks. You can also do this in a bowl with a pastry cutter. Set aside. Whisk together all of the french toast ingredients, except for the bread, in a large bowl. Once combined, add the bread cubes and toss until every cube is soaked. Cover with plastic wrap and refrigerate overnight. When you're ready to bake the french toast, preheat the oven to 325. Lightly grease or spray a springform pan with oil. Spread 1/2 of the streusel mixture onto the bottom of the pan. Add 1/2 of the bread cubes. Spread the remaining streusel onto the bread cubes. Add the remaining bread cubes, pour any remaining liquid over the top and press it all down into the pan. Place the pan in the oven and bake for 25-30 minutes. Remove from oven and let sit for about 5 minutes. Remove the outer ring of the pan. Use your serving plate and the bottom of the pan to invert onto the serving plate. Slice and serve warm with maple syrup. Enjoy! Did you do anything fun for Easter or Passover brunch? What did you make? 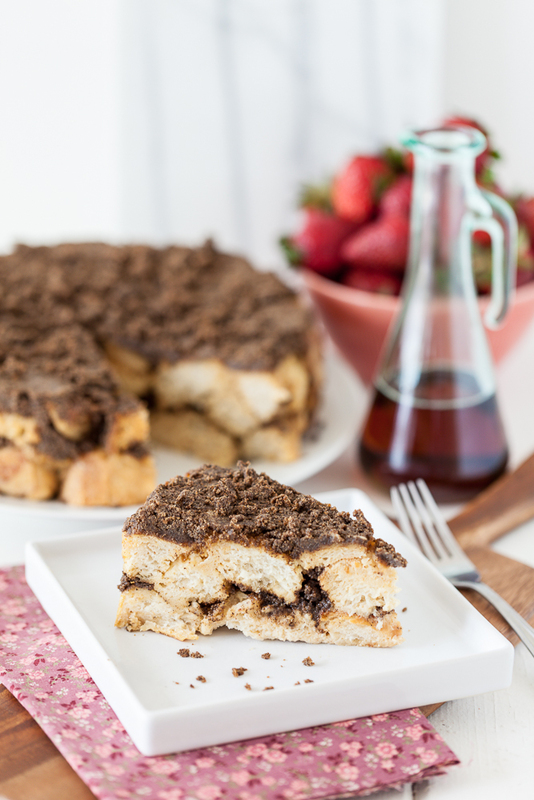 27 Responses to "Baked Coffee Cake French Toast"
these photos are absolutely stunning! and you are once again a magical woman. this looks fabulous! Oh man what an amazing Easter Brunch Treat! 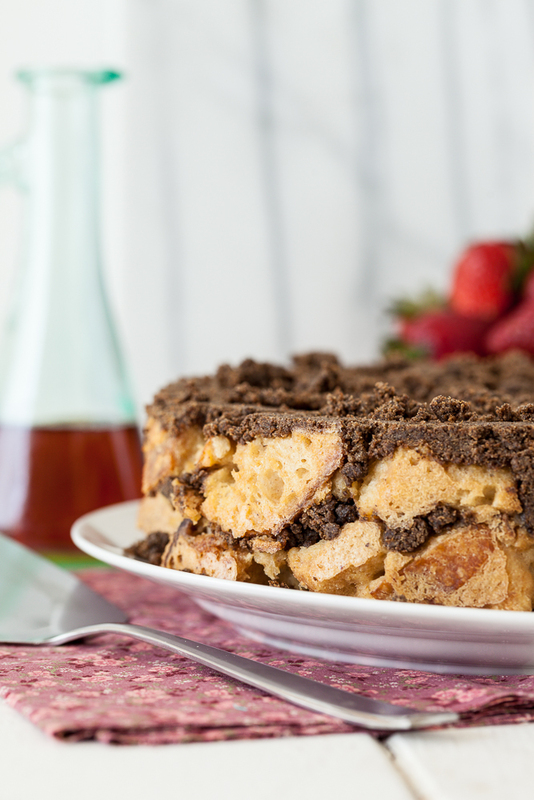 I love a good french toast bake, Justin on the other hand would rather straight up FT- everything’s better with Struesel! What a beautiful looking cake! I would love to eat cake for breakfast. 🙂 My family celebrated Easter by going out for sushi! Thanks, Melissa! 🙂 Have you found a good place for vegan sushi in Colorado? That looks a-maz-ing!!!! 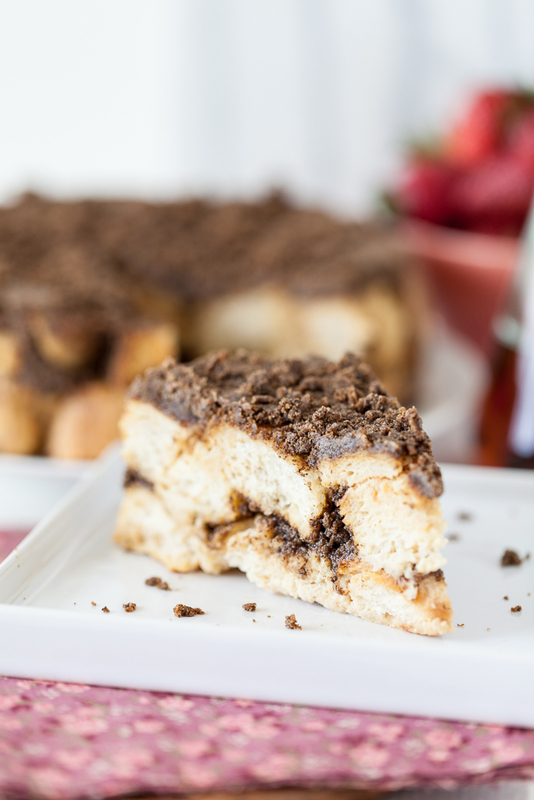 I love coffee cake and french toast. 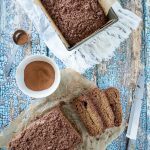 This will be one of the first things with cinnamon that I will make when I try eating cinnamon again! This is what i was missing too. that beautiful slice with all that cinnamony streusel! just perfect! I’m right there with you about the greatest joys in the kitchen stemming from pleasing your eaters. 🙂 My main “receiver” of my fare doesn’t have the most discerning palate so he eagerly devours pretty much anything I put in front of him. But when eater enthusiasm is coupled and equaled with my own excitement over a dish, that makes the creation that much more rewarding and satisfying. Chris’ photos are stunning, as usual. 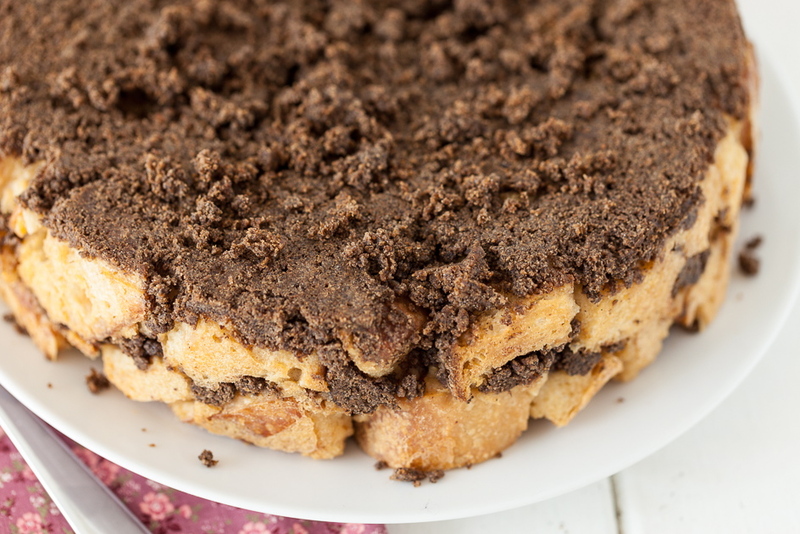 I’m not much for bread-y dishes, especially when coupled with sugar, but I’m a sucker for anything coffee cake. And your French Toast version looks irresistible! This looks so fun! I love combining two different dishes into one new one, and this sounds really creative. 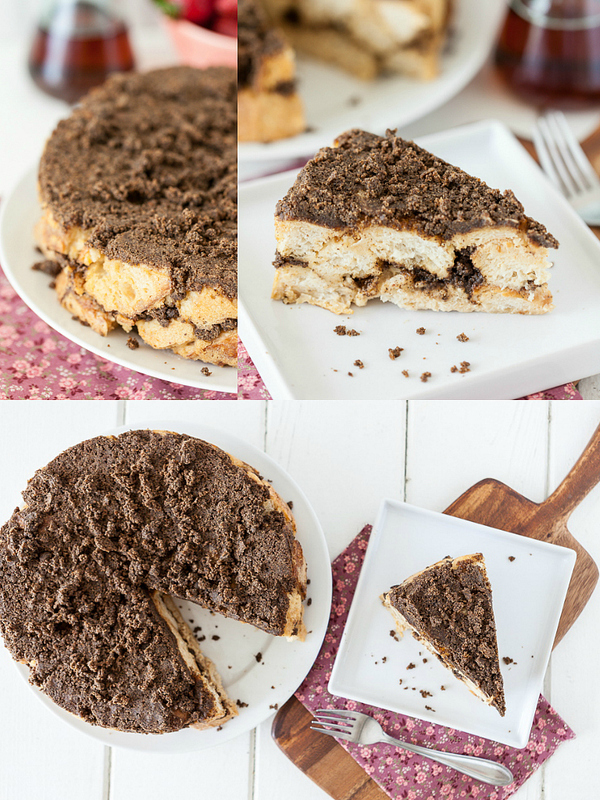 I love the thick layers of streusel; those are always my favorite parts of a coffee cake! Amy recently posted…Yo Ho, Yo Ho, Yogurt for Me! Yeah, I pretty much want to make this, like RIGHT NOW. So good Kristy! 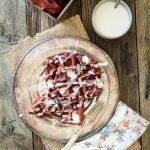 Somer recently posted…New Recipe Page! Thank you, Somer! It is pretty darn good! Chris is right. That is “wow” all over. Hey! So I just made this and it’s delicious! But I’m gonna have to try again at some point. So I have a couple questions. I baked it for 10-15 minutes longer, 5 of those minutes at 350, and it still came out kind of mushy. I did make a couple substitutions, so hopefully you can help me out! I didn’t have creamer, so used 3 cups of almond milk, and turned it into buttermilk with apple cider vinegar. Would that have been the culprit? Or did I just not use enough bread? 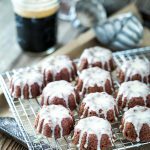 Cealiea recently posted…hoppy easter! + my fave grilled cheese! I’m so happy you liked it! The center is a little softer. If it was too mushy, I would bet that it was not enough bread. I bet it will be amazing with apples! Good luck!